Adding this variable angle slant hole collimator to an existing breast molecular imaging system allows the system to get six times better contrast of cancer lesions in the breast, providing the same or better image quality while also potentially reducing the radiation dose to the patient by half. NEWPORT NEWS, VA. – Preliminary tests have demonstrated that a new device may enable existing breast cancer imagers to provide up to six times better contrast of tumors in the breast, while maintaining the same or better image quality and halving the radiation dose to patients. The advance is made possible by a new device developed for 3D imaging of the breast by researchers at the Department of Energy's Thomas Jefferson National Accelerator Facility, Dilon Technologies and the University of Florida Department of Biomedical Engineering. While a mammogram uses X-rays to show the structure of breast tissue, molecular breast imagers show tissue function. For instance, cancer tumors are fast growing, so they gobble up certain compounds more rapidly that healthy tissue. A radiopharmaceutical made of such a compound will quickly accumulate in tumors. A radiotracer attached to the molecule gives off gamma rays, which can be picked up by the molecular breast imager. 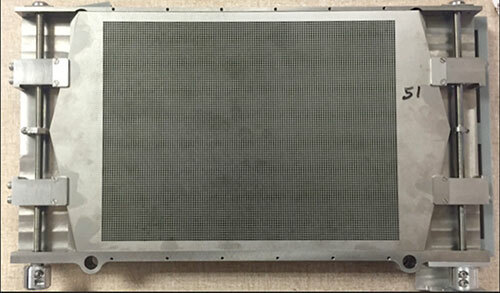 Current molecular breast imaging systems use a traditional collimator, which is essentially a rectangular plate of dense metal with a grid of holes, to “filter” the gamma rays for the camera. The collimator only allows the system to pick up the gamma rays that come straight out of the breast, through the holes of collimator, and into the imager. This provides for a clear, well-defined image of any cancer tumors. The variable angle slant hole collimator, or VASH collimator, is constructed from a stack of 49 tungsten sheets, each one a quarter of a millimeter thick and containing an identical array of square holes. The sheets are stacked like a deck of cards, with angled edges on two sides. The angle of the array of square holes in the stack can be easily slanted by two small motors that slide the individual sheets by their edges. The result is a systematic varying of the focusing angle of the collimator during the imaging procedure. “Now, you can get a whole range of angles of projections of the breast without moving the breast or moving the imager. You’re able to come in real close, you’re able to compress the breast, and you can get a one-to-one comparison to a 3D mammogram,” Weisenbeger explained. In a recent test of the system, the researchers evaluated the spatial resolution and contrast-to-noise ratio in images of a “breast phantom,” a plastic mockup of a breast with four beads inside simulating cancer tumors of varying diameter that are marked with a radiotracer. They found that using the VASH collimator with an existing breast molecular imaging system, they could get six times better contrast of tumors in the breast, which could potentially reduce the radiation dose to the patient by half from the current levels, while maintaining the same or better image quality. The test results match a published paper that predicted this performance via a Monte Carlo simulation. The collimator was built at Jefferson Lab and the test results were analyzed at the University of Florida with funds provided by a Commonwealth Research Commercialization Fund grant from the Commonwealth of Virginia’s Center for Innovative Technology, and with matching support provided by Dilon Technologies. The test results were presented at the 2016 Society of Nuclear Medicine and Molecular Imaging Annual Meeting in San Diego on June 13. The technologies developed for the Variable Angle Slant Hole Collimator are included in two filings to the U.S. Patent and Trademark Office. Adding a new device to an existing breast molecular imaging system allows the system to get six times better contrast of cancer lesions in the breast, providing the same or better image quality while also potentially reducing the radiation dose to the patient by half. The device may also allow for 3D molecular breast images at higher resolution than current 2D scans in a format that may be used alongside 3D digital mammography.